Cooler temperatures are a signal that it is time to get your home ready for fall and winter. With pleasant temperatures, it is easy to spend some time outdoors working on your lawn, in the garden and on the exterior of your home. Putting in a little effort now will ensure that your home will be in good shape throughout the winter. Our list of exterior and interior home maintenance tips will help you get your home in peak condition for the cold weather ahead. Seal openings and cracks. Inspect the foundation of your home and brick work or stone work for cracks and caulk or seal the openings. This will prevent water from freezing in the cracks which can cause more serious damage later. Check your driveway and sidewalks for cracks. Clean any debris out of the cracks and repair damage with driveway filler and seal with a coat of commercial sealer. Apply weather stripping in areas where two surfaces meet such as around doors and windows. Also weather strip the garage door creating a tight seal between the door and the ground. This will eliminate drafts and prevent small critters from seeking shelter inside your garage. Before you light a fire in the fireplace this fall, hire a chimney sweep to clean the chimney and flue removing all creosote buildup from last year. Also, inspect the chimney for cracks and repair them. Clean the gutters. Clogged gutters and downspouts can cause a wide range of problems throughout the winter months including damage to the foundation or landscaping as well as flooded basements. 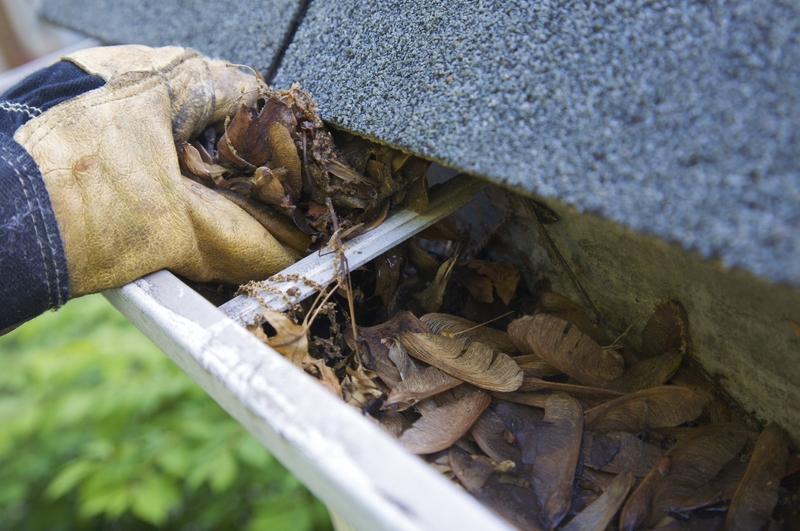 Take some time to clear debris from the gutters and downspouts or hire a professional to clean them. Additionally, make sure downspouts carry water away from the foundation. Inspect the roof for minor damage such as curling or cracked shingles, missing shingles or holes. Make necessary repairs immediately preventing leaks from winter storms and melting snow that can cause more serious damage in the future if not properly repaired. Inspect porch and deck railings. Make sure they are safe and secure for use during bad weather this winter. Inspect plumbing. Prevent costly damage and repairs to pipes by taking action before the onset of winter. Use foam padding or special insulating tape to protect both hot water pipes and cold water pipes against freezing. Throughout the winter check pipes in basements and little used areas every few days to make sure no ice or frost is accumulating on the pipes and that no cracks are developing. Hire a professional to service (clean, inspect and repair) your heating system. Your heating system will use fuel more efficiently and last longer if it is running properly. A few minutes of prevention at the onset of winter can save you hundreds of dollars on costly damage and repairs to pipes and plumbing. Insulate pipes or use heat tape or a thermostatically controlled heat cable to prevention pipe bursts. Jump into action now, and prevent major issues in the future. Also, replace your furnace filter. Check the controls of your heating system/thermostat to make sure it is operating properly, or consider installing a programmable thermostat. Test and replace the batteries in your smoke detectors and carbon monoxide detectors. Inspect insulation. Attic insulation protects your ceilings from air leakage. If your insulation is old and worn from years of harsh weather (or damaged from pests that have made a home in your attic) your furnace will have to work twice as hard to heat your home this winter. Hire a professional contractor to install new insulation in your attic. Clear leaves from your yard or better yet, mulch your leaves when you mow. The mulched leaves will decompose adding nutrients to the soil. Winterize your lawn mower by draining the fuel tank or running it until the fuel tank is empty. Wipe down the lawn mower removing all grass and debris for the exterior. Store it in a dry place for the winter. Prepare lawn and garden equipment for storage. Drain fuel from gas-operated power equipment like chain saws and leaf blowers. Additionally, clean, organize and store other summer garden tools like shovels and small hand tools. Reseed patchy areas of grass. Trim trees and shrubs. Trimming in the fall after the leaves have fallen creates less mess and makes it easier to see what limbs and growth should be trimmed. Removing dead limbs and those that are growing too close to your home and powerlines will prevent excessive damage during an ice storm. Plant bulbs for flowering spring plants such as tulips and daffodils. Drain, roll up and store garden hoses and sprinklers (do not leave them attached to outdoor faucets during the winter.) If you have a lawn irrigation system, make sure it is drained properly. Stock up early. Don’t wait until the first snow to purchase ice melt, snow shovels and ice scrapers for your car. Buy these items in advance so your ready when the first snow falls. Additionally, find a snow removal service in advance so you’re not out of luck when your driveway and sidewalks need to be cleared of snow. With winter fist approaching, this home maintenance tips will help you have your home and yard ready for the cold months ahead.